No matter what type of cooktop you have, chances are you’ll spill something while cooking on it. Some surfaces are easier to clean than others, but our cooktops are a highly visible part of our kitchen that we want to look nice. Find out how to clean and maintain a cooktop. Know what type of cooktop you have. Is it a gas or electric coil range? Is your cooktop an enamel surface or a ceramic glass smooth top? Can your cooktop be raised up allowing you to clean crumbs and debris from below? Take a few moments to read the manufacturer’s manual and learn about your cooktop. Wipe the cooktop down. Wiping your cooktop down each time it’s used will do wonders for keeping it looking shiny and new. While you may still need an occasional thorough cleaning, grease and dirt won’t stand a chance with a frequent wipe down. Clean an enamel surface. Use a plastic scrubber and mild detergent or dish soap and water. Don’t use abrasive items that can scratch your enamel. Enamel can stain, so it’s important to wipe up spills right away. Be especially careful of acidic spills like vinegar, tomato products, lemon juice, and other citrus products. Pull off the knobs and clean them and the area around them with dish soap and water. Raise the cooktop to wipe up spills that may have accumulated beneath the cooktop surface. Clean the coils. 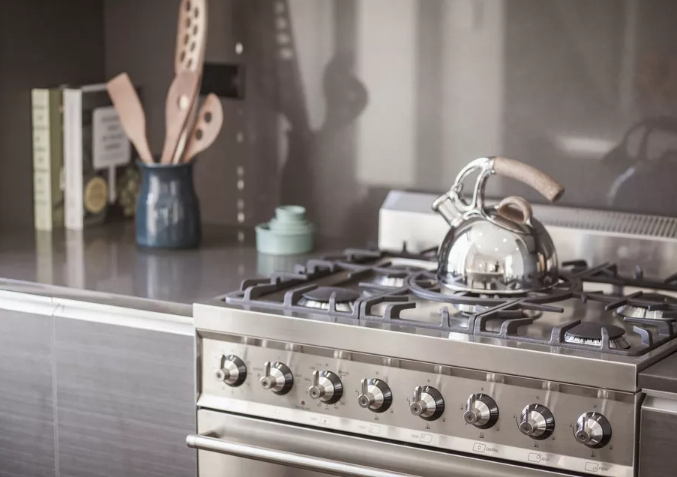 Electric coils don’t need to be cleaned because of their self-cleaning nature, but gas burners tend to accumulate layers of thick grease and spills that turn into burned on junk. You may need to soak the parts in hot water and dish soap or even scrub with a plastic scrubber. Occasionally only an abrasive cleaner will do the trick. Don’t forget to wipe down the drip pans and bowls underneath the coils with a mild abrasive, or soak them to remove stubborn spills. Clean smooth cooktops. The great thing about a smooth cooktop is that there are no nooks and crannies for food and spills to accumulate in. Wiping down the top of a smooth cooktop is easy to do after each use. Smooth cooktops can be scratched, so it’s important to use a spoon rest and wipe up spills right away. Be careful about placing foil, lids, or dirty pots on the surface because of scratching. For regular cleaning, wiping the cooktop down with a mild detergent and water works best. Occasionally you may want a more thorough cleaning. Use a specially formulated smooth cooktop cleaner for best results. When cleaning control knobs and control panels on cooktops and ranges, be careful that you don’t scrub off the markings. Treat these components and their markings gently.